Scientific circles of Russia, Tajikistan, Kazakhstan, Kyrgyzstan, Uzbekistan, Italy, France, and Great Britain drew an open letter to the president of Tajikistan asking Emomali Rakhmon to intervene in the matter of Professor Guzel Maitdinova. Authors of the letter hope that the situation will be settled fairly. Click here for a detailed account of the Maitdinovs' conflict with the local authorities (in Russian). Here is the text of the letter. media outlets of Central Asian countries, Russia, and other countries. 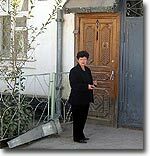 The authorities of Dushanbe are determined to evict the family of Professor Guzel Maitdinova from its house and to demolish the building. Bailiffs and workers hired by the municipal administration are absolutely unconcerned by the fact that there are people indoors. The operation proceeds even though the Dushanbe prosecutor's office has uncovered numerous violations of the law in connection with the decision to evict Maitdinova and regardless of her open letter to the president of Tajikistan. Maitdinova is not offered an adequate housing as a recompense. Maitdinova's colleagues from Russia, Kazakhstan, Kyrgyzstan, and Uzbekistan appeal to you, Mr. President, as the guarantor of freedoms and rights of citizens of the Republic of Tajikistan, in the hope that You will intervene and personally see to a fair solution (an adequate housing for Maitdinova in central Dushanbe). We have always viewed Tajikistan as a country with long-standing traditions of science and culture and the respect they command. We earnestly hope that this episode will have no negative effect on the image of Tajikistan in the eyes of the international scientific community. The Dushanbe authorities being cynically blase, we retain the right to spread this letter. Your signature will be appreciated. Send signatures to ferghana@fergananews.com.